There are so many college football stadiums that would be special to witness, but here’s a list of the 20 that would be the best sights to see. The college football world is now dominated by the “arms race” for the best facilities in the nation. Whether it’s for recruiting purposes or just to build the brand, athletic departments across the country have invested millions into the upgrade of their athletic facilities. However, there is something to be said for the beauty of the great stadiums for the blue blood programs. 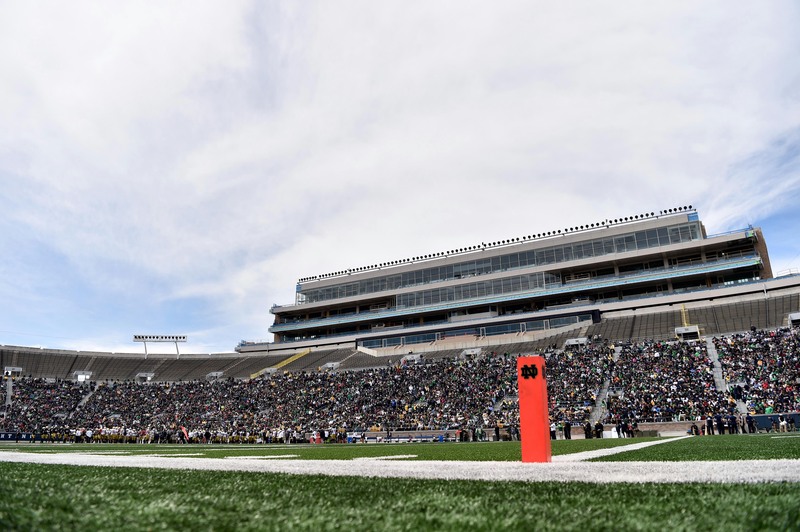 Narrowing down a list of the best college football stadiums in the country is not easy, but that’s also part of the greatness of the college football landscape. There’s easily 50 programs with stadiums that all have numerous impressive qualities. For example, the Iowa State Cyclones and NC State Wolfpack have Jack Trice Stadium and Carter-Finley Stadium, each with average attendances well over 50,000 fans (sorry to NCSU fans for the mistake a few days ago as you can see here). And NC State and ISU would never really be mentioned among the blue bloods in college football, but they have good facilities in respected Power Five conferences. The most important things taken into account when selecting the 20 stadiums in this ranking include capacity, atmosphere, recent upgrades, program tradition, and overall design of the stadium. Obviously you cannot pick all the stadiums on this list just based on metric. To some degree, there’s a few stadiums that just cannot be left off this list because of the iconic significance of the actual stadium and the specific program. Now, let’s take a look at the 20 college football stadiums you must see in your lifetime, and a few honorable mentions. 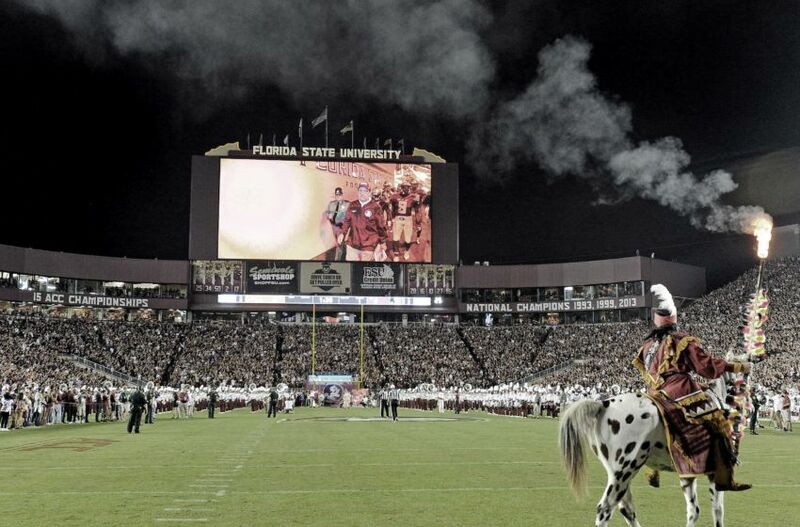 If one stadium just missed the cut it was that of the Florida State Seminoles at Doak Campbell Stadium. It’s likely that you could hear the echo of the chop chant even during the offseason months. There’s likely to be multiple Noles fans upset, to say the least, with not being in the top 15. But there are so many great options to choose from. FSU averaged an attendance of 76,800 fans in the 2016 season. Doak Campbell is just one of three FBS programs in Florida that have solid programs. Yet, with the Miami Hurricanes losing their legendary home at the Orange Bowl nearly a decade ago, Doak Campbell and Ben Hill Griffin are really the only noteworthy college football stadiums in the state. And the Florida Gators averaged more than 10,000 fans per game in “The Swamp” last season than that of the Noles’ fans at Doak Campbell. 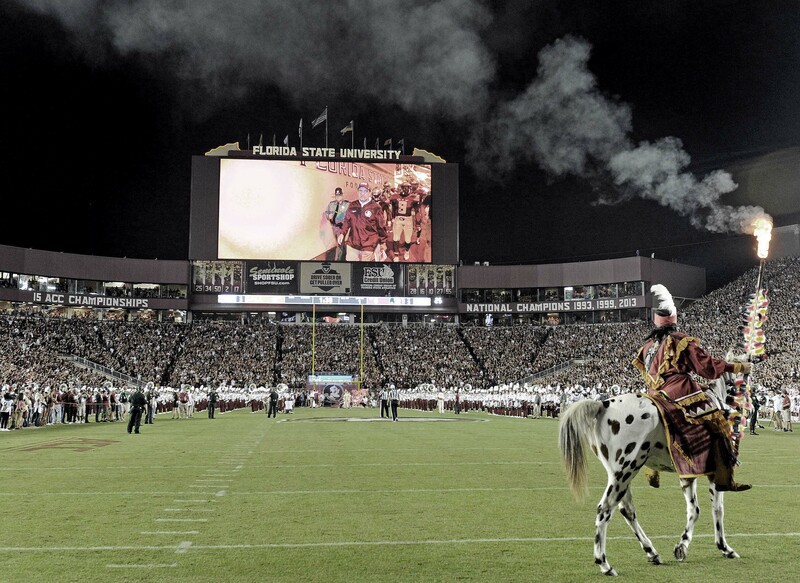 If you happen to make a sports trip to Florida, Doak Campbell is still a sight that you would not want to miss. The talent that has rolled through Tallahassee in recent years is mind boggling. Head coach Jimbo Fischer consistently recruits FSU into the top 10 class rankings. The memories of players like Jameis Winston, Dalvin Cook, E.J. Manuel, Jalen Ramsey, and Christian Ponder, just to name a few recent top tier talents to play at Doak Campbell, should still be fresh in the minds of FSU fans. There’s been some great Seminole teams, especially the 2013-14 National Championship team, to play at Doak Campbell in recent memory. Recent renovations brought Memorial Stadium to a capacity of 90,000 after it was previously at a capacity of 85,000. Even with a dip in the Cornhuskers’ success over the last few seasons since joining the Big 10, the fan base is still strong. 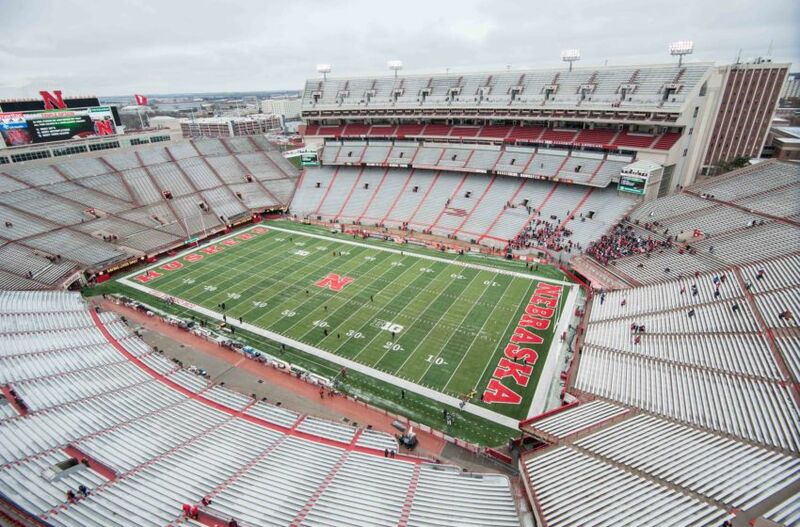 Nebraska fans are known as one of the most loyal in college football. And the sight of Nebraska Memorial Stadium in the skyline of Lincoln is one that most college football fans who have witnessed it will not forget. 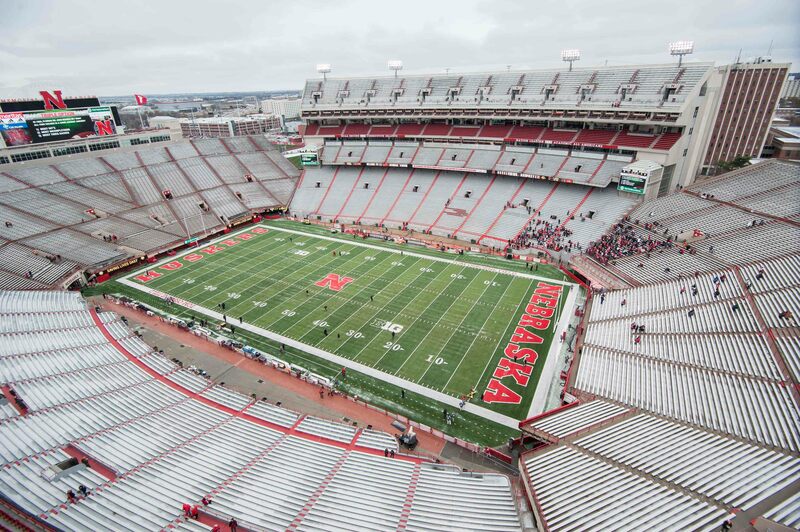 The 2014 meeting between Nebraska and the Miami Hurricanes set the record attendance for Memorial Stadium at 91,585. Even though both programs are not what they once were, it’s definitely cool to see to of the great programs, especially throughout the 1980s and 1990s, meet up once again. The overall atmosphere in Memorial Stadium is still one of the most hostile for any team to play in. Formerly at Oregon State and now third-year head coach Mike Riley did dramatically improve the record of the Huskers in 2016. Nebraska finished 6-7 in 2015 and improved to 9-4 in 2016. The same type of improvement in 2017 could put Nebraska back in national contention in the college football landscape once again. Possibly seeing the Huskers back at the top of the college football world in Memorial Stadium would be a great site to see. Having the blue blood college football programs competitive makes the sport that much more fun to watch. 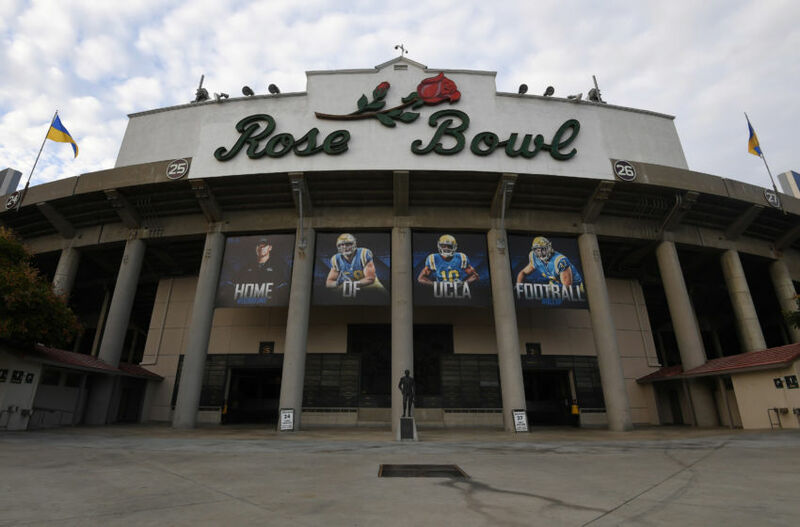 There’s an asterisk next to the Rose Bowl because UCLA has not put its best foot forward in recent years. Los Angeles, as a whole, has a lot going on in regards to their sports scene, and it’s hard for any team to in the city to carry a consistently large fan base if they put up mediocre results season-by-season. That’s one of the problems that the Bruins have run into. Yet, the Rose Bowl is home to much more than just UCLA football now. The IOC visited the Rose Bowl just a few weeks ago, part of the evaluation of the city of Los Angeles for its bid to host the Olympics. 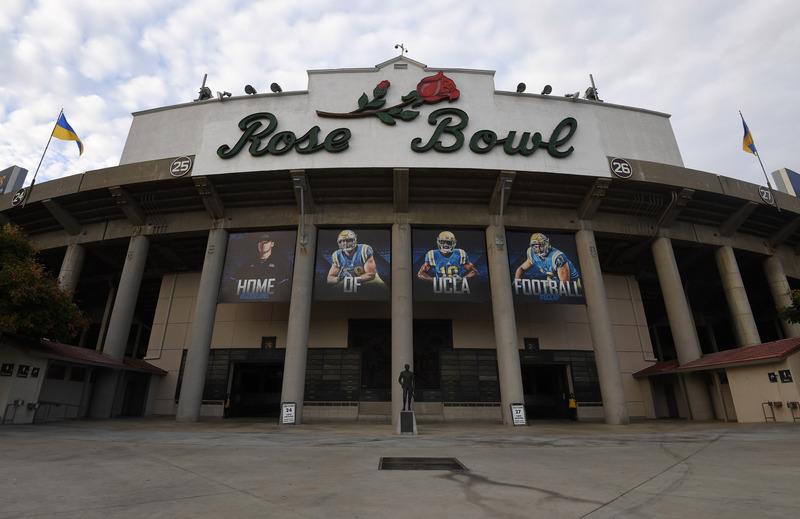 More than anything, it’s home to the “Granddaddy of them all” — the actual Rose Bowl Game. The last Rose Bowl to take place in Pasadena was no disappointment either. LA’s own USC Trojans defeated the Penn State Wildcats a narrow three-point margin in a thrilling 52-49 victory that became an instant classic. The atmosphere of the Rose Bowl for UCLA would not be up to par with the rest of the schools and stadiums on this list since the Bruins averaged less than 68,000 in attendance last season. That means Bruin fans roughly filled up the Rose Bowl to only 73 percent capacity last season. If you’re visiting empty stadiums just to see the sights of the stadiums themselves, then the Rose Bowl is definitely a must see. However, if you’re finding different stadium atmospheres worthy of witnessing during the actual season then watching UCLA play in the Rose Bowl will not be the best atmosphere you can find. Autzen is the smallest stadium on this list, capacity wise. The emergence of the Oregon Ducks in recent years put this stadium and the fan base on the map. Since the days of Chip Kelly, Autzen Stadium has become home to possibly the loudest stadium with a capacity of less than 60,000. 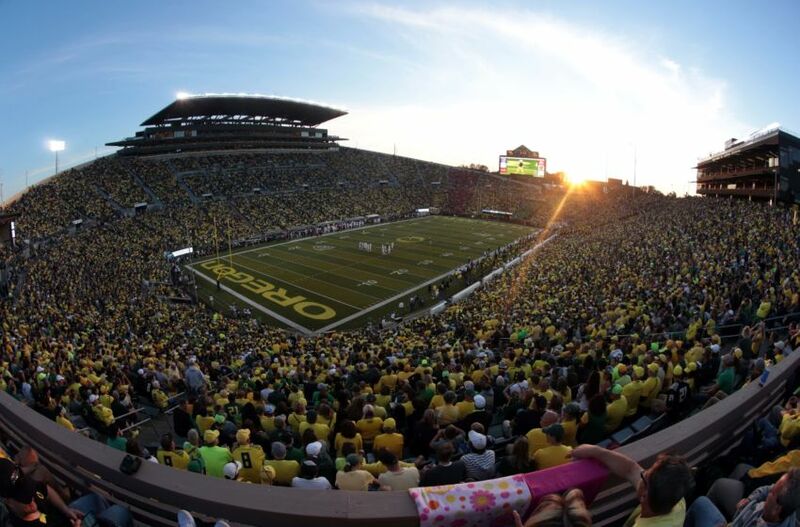 Moreover, Autzen is one of many formidable atmospheres in the Pac-12 that gets largely overlooked by many in the college football world. Another stadium at least worth noting, Husky Stadium, home of the University of Washington football program is a great atmosphere as well. Oregon has fallen on tougher times over the last two seasons. Including a meltdown against the TCU Horned Frogs in the Alamo Bowl two seasons ago, the Ducks are 4-9 in their last 13 games. However, former South Florida head coach Willie Taggart now takes over in Eugene and hopes of returning to contention looms large in the minds of Ducks fans. Even with Oregon having a down season on the field, Ducks fans showed out last season. They posted an average attendance beyond the capacity of 54,000. Overall, the unique architecture of the stadium, crazy colors, recent hyped atmosphere, and the noise that is created in this stadium with a smaller capacity than most stadiums with this level of significance in the college football world, gives it the credibility to at least make it as an honorable mention on this list. Another blue blood program on this list as an honorable mention, the Auburn Tigers had another solid season at their home, Jordan-Hare Stadium. This stadium is also the final honorable mention on this list. Jordan-Hare is one of the most recognizable stadiums in the country. Auburn fans will not soon forget the sights of legends like Cam Newton, who led them to a National Championship in 2010, playing at Jordan-Hare. 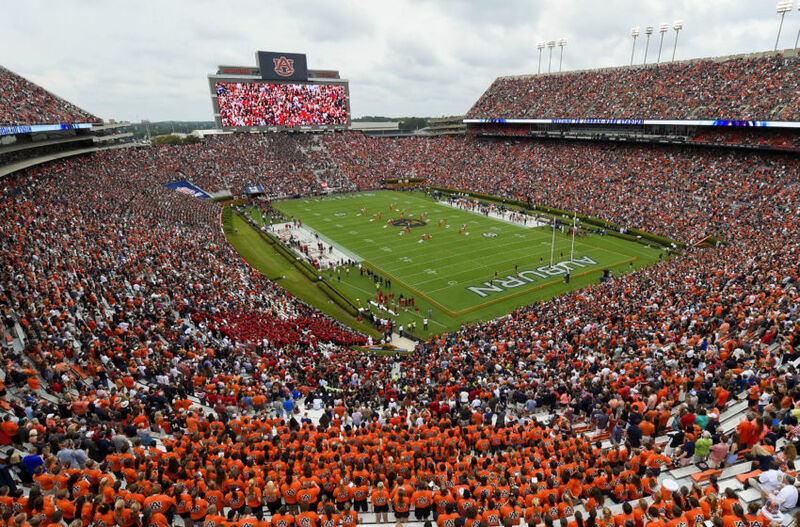 Along with Doak Campbell Stadium, Jordan-Hare just missed the cut inside the top 15 as it is a great site to witness whether you’re watching an actual game or just visiting during the offseason. Tiger fans get the privilege of having such a great venue to watch their football program compete or for a few weekends each and every Fall. Not only have Auburn fans got to witness just one great team when they brought home a title in 2010. But the Tigers also nearly brought home another title under Nick Marshall in 2013 when they fell just short to Jameis Winston and the Florida State Seminoles in the final BCS Title Game. 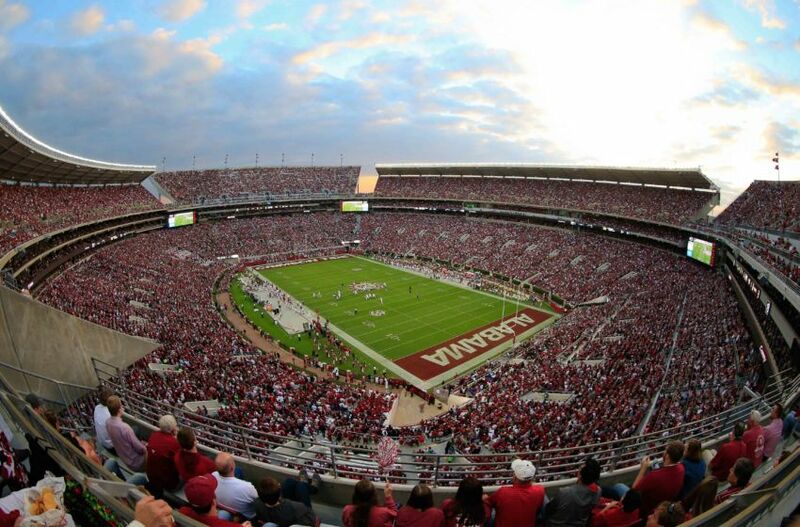 Alabama is just one of four states on this list that feature two different stadiums in the same state. Considering those other states are California, Texas, and Florida, you can really see how much the people in Alabama love their football, whether that be Tiger or Tide fans. 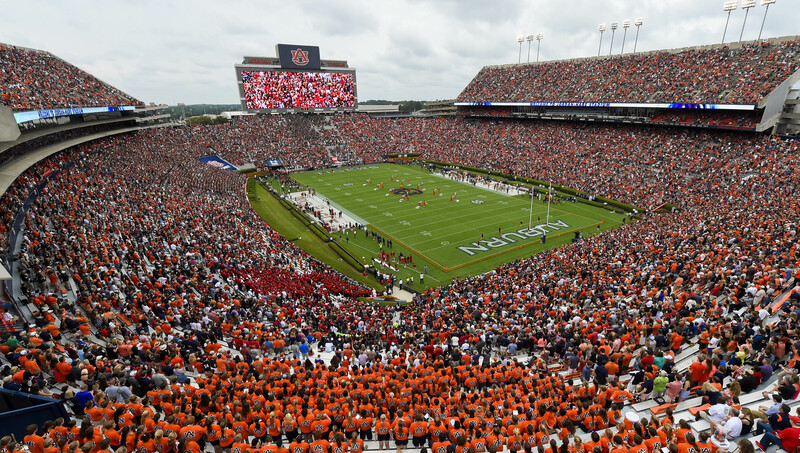 Both Jordan-Hare Stadium and Bryant-Denny Stadium are magnificent places for any general college football fan to witness. 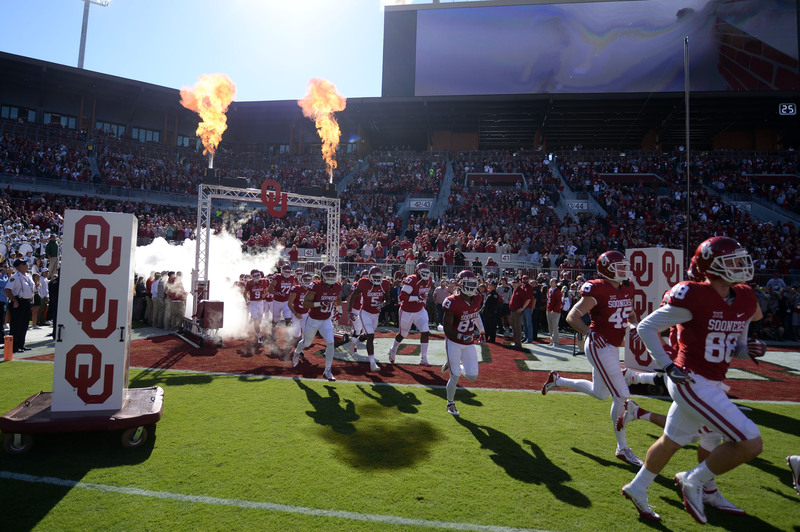 Oklahoma Memorial Stadium is home to one of the absolute greatest college football programs all time in the Oklahoma Sooners. You cannot doubt the greatness that has gone through Norman from the Barry Switzer days all the way up to now with current head coach Bob Stoops. OU fans live and die for their Sooner football. The university has already put in the place the construction to expand Oklahoma Memorial to a capacity larger than 90,000. Yet, the stadium ended the 2016 season with the capacity of 86,112. 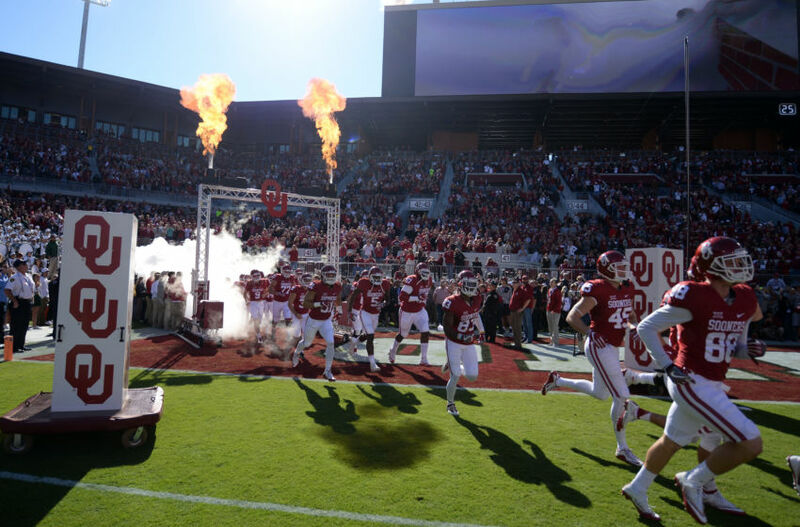 The thought of more Sooner fans shaking the stadium in Norman with even more noise should frighten Big 12 opponents playing there. Oklahoma Memorial is a great site for Sooner fans, and just college football fans in general (outside of those that wear orange), on the edge of the OU campus. The outside of the stadium seems to tower all the way to the sky when you look up and see the letters “Oklahoma Memorial” etched in the stone of the upper stadium walls. The three sides of the stadium that close off Oklahoma Memorial are built around the large and iconic OU scoreboard that will soon become even bigger in the South Endzone after renovations are complete. 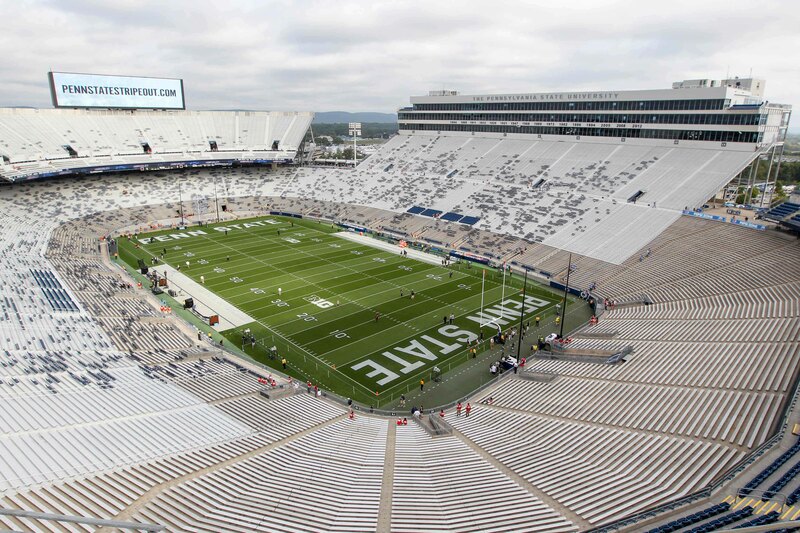 Pennsylvania State University and Happy Valley happily play host to the second largest stadium in college football, only behind Michigan Stadium. Recovering from the Jerry Sandusky scandal was no easy task for Penn State and the Nittany Lion faithful, but this is still a tremendous atmosphere in Happy Valley. The fans rallied around the program and showed support for those victims in the scandal ever since it happened just a few years ago which has been and continues to be a fantastic thing to see. The great history of Penn State football lives on through the current talented offensive duo of quarterback Trace McSorley and running back Saquon Barkley that led to a Big 10 Title and a Rose Bowl berth. PSU fans also got to witness their Nittany Lions defeat the Ohio State Buckeyes at home, giving OSU their only loss of the regular season. PSU was one of only seven teams to have an average attendance over 100,000 last season. Just by shear size of the stadium, it’s hard to not be impressed. Yet, the view of Pennsylvania’s mountains in the background combined with the bright white color of the U that outlines the back half of the stadium are just two of the things that make Beaver Stadium unique. The Big 10 has many great stadiums to visit, but it’s hard to top the experience you get from seeing Happy Valley and it’s crowning jewel, Beaver Stadium. Home of the 2016 National Champions, Clemson Memorial Stadium features quite a few things you cannot see at any other stadium. It starts with the walk down into death valley while “rubbing the rock.” However, Howard’s Rock is just one of many unique things you can see at Clemson Memorial Stadium. The east side of the stadium features “Clemson” written out in the upper concourse. The sea of orange that fans form during home games is also special whether you see it on television or witness it in person. The “Tiger Walk” leads you down to the front of the stadium and in site of Howard’s Rock that is a spectacular site in and of itself. You get washed over with an appalling sense of amazement when the East and West sides of the stadium open up when you approach the front gates. 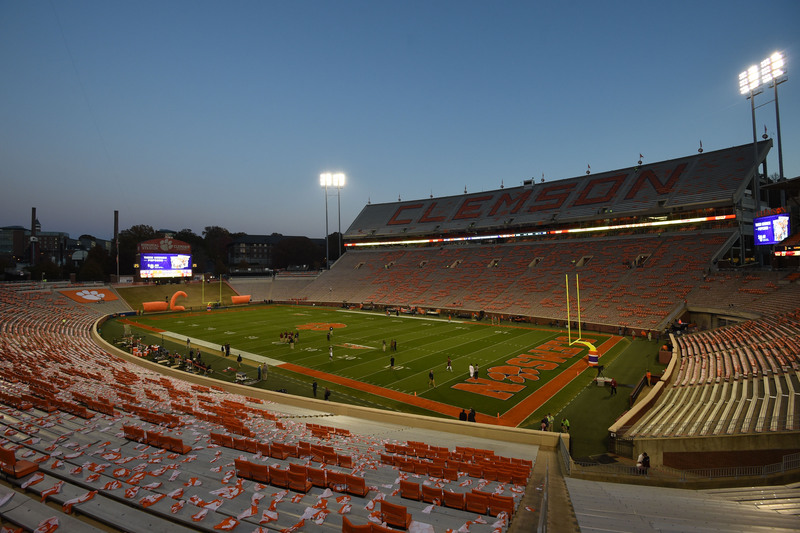 An enormous stadium seems to emerge out of nowhere when you finally reach Clemson Memorial Stadium on the campus of Clemson University. 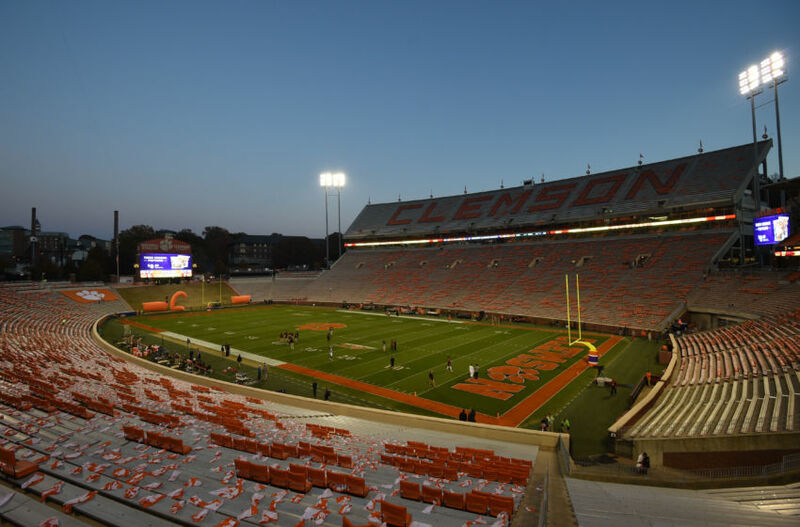 Combining the tradition and uniqueness of Clemson Memorial Stadium means that you cannot leave this stadium off out of the top 15, let alone off the list completely. Head coach Dabo Swinney finally established the Tigers as a consistent player in the field of true championship contenders in the college football landscape and it’s awesome to finally recognize that. Much like the Rose Bowl for UCLA, The Coliseum does not only play host to just one team. The USC Trojans now share The Coliseum with the Los Angeles Rams since they moved from St. Louis. However, USC seems to have a much brighter outlook for the 2017 season than that of the UCLA Bruins with all the hype surrounding quarterback Sam Darnold and the Trojans. The Coliseum is the highest-ranked West Coast stadium on this list, and deservedly so. 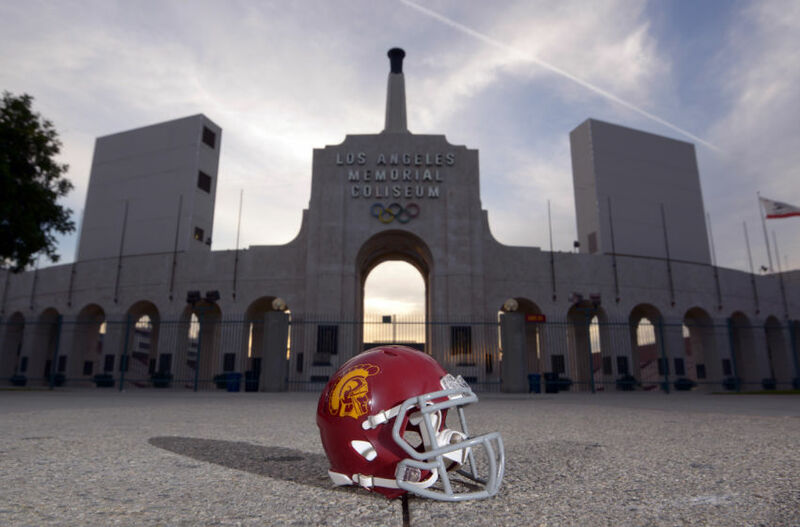 USC boasts one of the most storied programs in college football history as they continue to “Fight On” today in The Coliseum with hopes of bringing home another National Championship. The echoes of the successes of players like Reggie Bush and Matt Leinart still loom large in The Coliseum. Former head coach Pete Carroll led some great Trojan teams in this stadium. 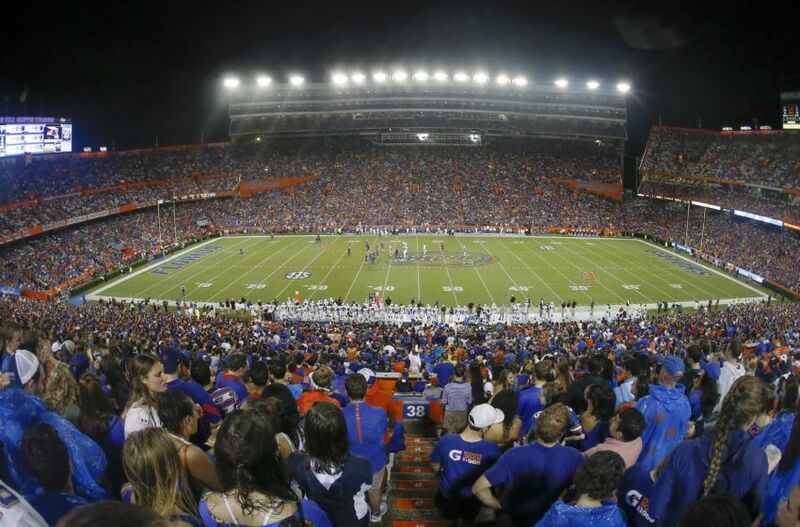 Ben Hill Griffin Stadium, also known as “The Swamp”, has a very unique atmosphere and feeling to the feeling inside the venue. The stadium has noticeable features on all sides outside as well, from the ramps at the south end of the stadium to the concourses and press boxes rising above the actual bleachers on the east side. 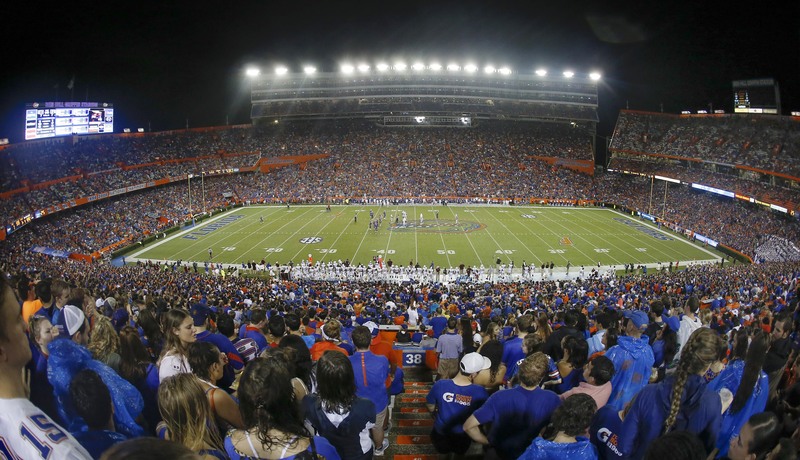 The Swamp is the largest college stadium in Florida and also generally the most amazing to witness in person. FSU fans might have a bone to pick with that statement, but Florida has averaged more than 10,000 more fans per game than the Noles and The Swamp is larger as well. UF retook their place atop the SEC East after a rough stint with former head coach Will Muschamp. Current head coach Jim McElwain has led the Gators to back-to-back SEC Championship appearances and SEC East titles. The most recent expansion for Ben Hill Griffin Stadium happened in 2008 to expand it beyond 90,000 seats to the nearly 92,000 capacity it has today. The 2008 expansion happened as a result of the Urban Meyer head coached squads that brought home two National Championships under quarterbacks Chris Leak and Tim Tebow during the 2006 and 2008 campaigns. Meyer later left UF for Ohio State, another team on this list, just a few years later. The Texas A&M Aggie faithful form what’s known as the 12th man every home game on Saturdays in the fall in College Station. The 12th man icon has since been distributed to multiple team across football, most notably the Seattle Seahawks. TAMU and the Seahawks have gone back and forth regarding who came up with the original 12th man idea. But it’s largely well-known in the college football world that the Aggies developed it before the Seahawks. Even with disappointing results more times than not, the Aggies have definitely seen some polarizing talents play at Kyle Field. Players like Johnny Manziel, Mike Evans, Myles Garrett and Christian Kirk, just to name a few, give Aggie fans quite a bit of excitement to see individual talents play each and every season. TAMU recently underwent massive upgrades and renovations to their football facilities and stadium. Kyle Field was last renovated after the end of the 2014 season to put it at its capacity of 102,000 plus that it sits at today. 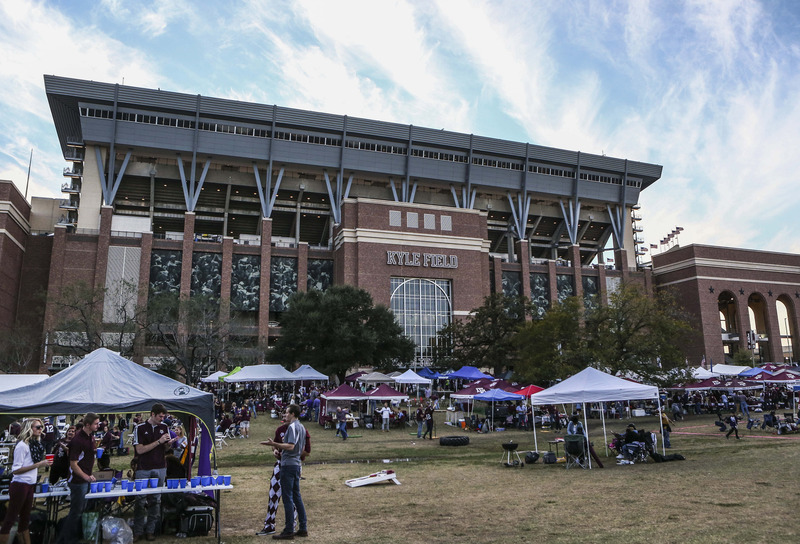 TAMU is also one of seven programs that posted an average attendance of more than 100,000 fans per game last season, with 101,917 attending each Aggie contest in 2016. 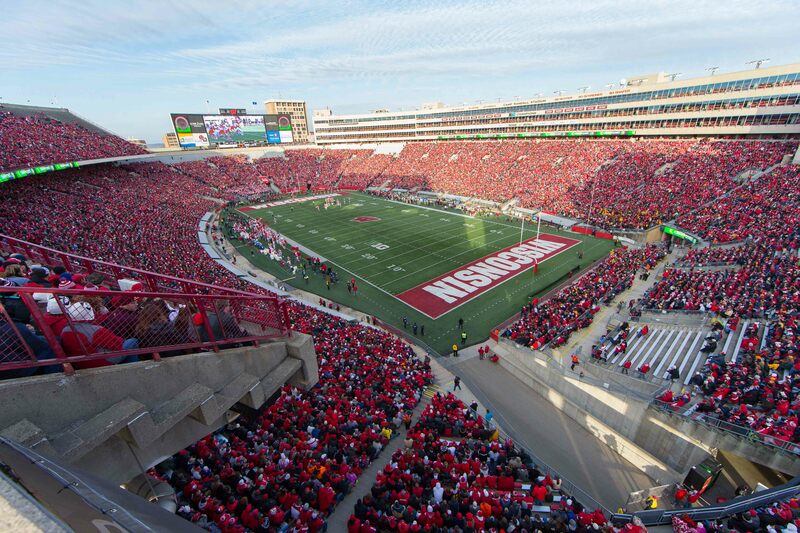 The Wisconsin Badgers play host to one of the most unique stadiums and atmospheres in all of college football. From the “jump around” tradition in the student section all the way to the view of the downtown Madison skyline over the back endzone in the stadium, Camp Randall seems like an awesome play to be during football season. Wisconsin is also notoriously known for having a great tailgating scene. 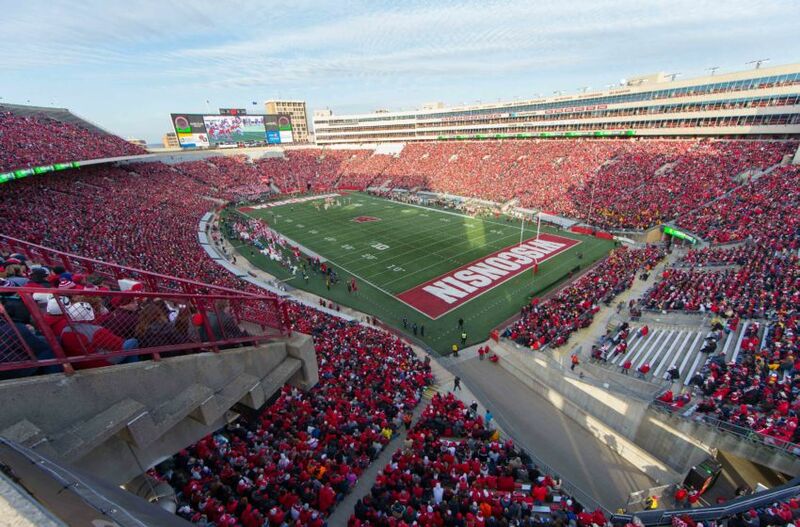 Attending a football game in Madison would be a treat for any college football fan looking for a good time. Moreover, the Badgers have remained a relevant program in the college football landscape for well over the last decade. They’re known for their ground and pound offense with balanced, quality defenses to back them up. Badger fans have witnessed NFL stars such as J.J. Watt, Melvin Gordon, and Joe Thomas, roll through Madison during the last 10 years. Camp Randall is also one of the oldest stadiums in the country. It was first used by the University of Wisconsin football program in 1917, with a capacity just under 12,000. 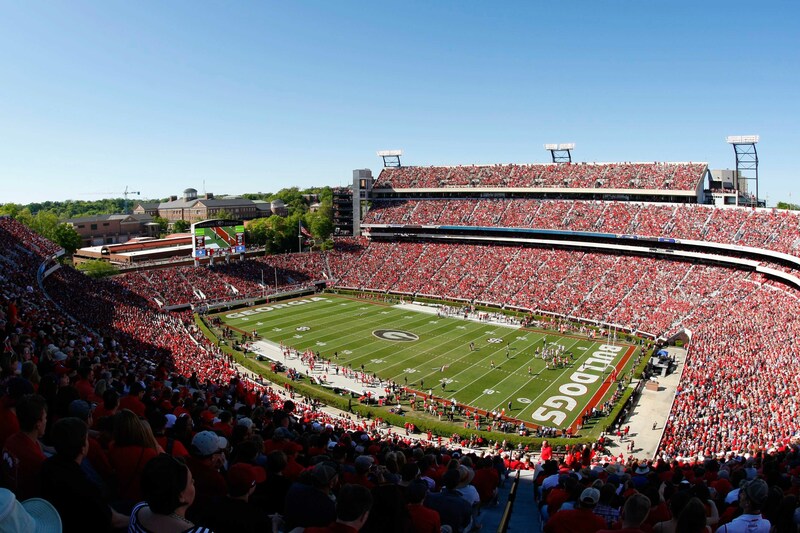 While the University of Georgia itself is a beautiful campus to see, Sanford Stadium is an even better sight. Every college football fan should make it a priority to get across the catwalk on the edge of campus and at the back end of the stadium where the bleachers cut off for room for the scoreboard. Sanford beautifully unveils itself to anyone walking across the UGA campus on more than four different sides. 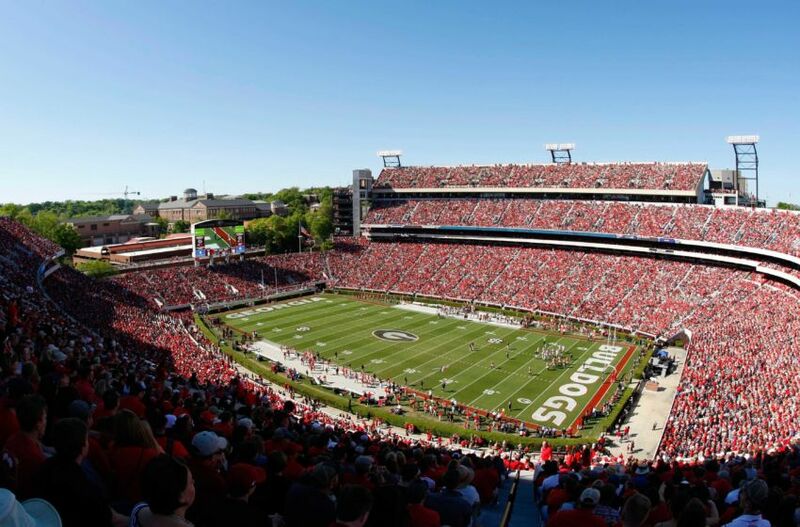 When more than 90,000 fans pour into Sanford during the Fall months in Athens, it forms one of the best, loudest, and most intimidating atmospheres in college football. This is one of the ten largest college football stadiums in the country and first opened in 1928. It was not the first venue used for football at UGA but it has established itself as one of the premier venues in the country. UGA fans hope that rising sophomore quarterback Jacob Eason and second-year head coach Kirby Smart can finally get them over the hump. Dawg fans consistently suffer the agony of failed expectations season after season. Whether it’s injuries or just falling short of preseason rankings, most recent seasons have not lived up to what they were expected to be in Sanford. Hopefully that changes very soon. Notre Dame Stadium is, by a considerable amount, the smallest stadium inside the top seven on this list. Actually, it’s the only one that holds less than 100,000 people. Yet, Notre Dame Stadium has been the venue of some of the greatest teams in college football history. Moreover, it’s also the home to possibly the greatest college football program in history. As you walk onto the campus in South Bend, you can feel the tradition of ND football rub off on you almost immediately, whether you’re a fan or not. And ND has formed numerous rivalries over the years. The Irish and its faithful did not have a fun campaign in 2016. Quarterback, and 2017 NFL Draft pick, DeShone Kizer had a rough final season altogether leading ND to a mere four wins last season. The tremendous atmosphere of Notre Dame Stadium obviously did not help the Irish win too many games in 2016. However, head coach Brian Kelly seems to have the program on the right track overall. And that’s good news for a coach of a program with some of the most impatient and perfectionist fans in the college sports world. 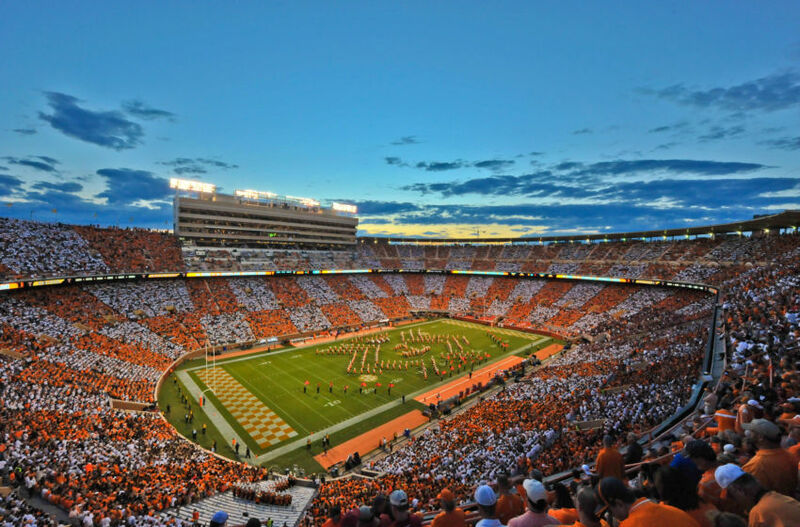 Neyland echoes the singing of Rocky Top six or seven times a year, and it’s one of the most iconic things you can witness as a college football fan. 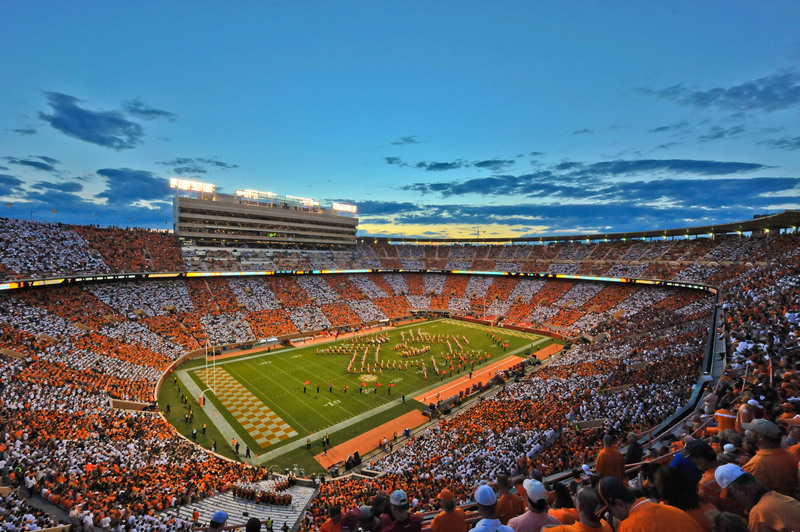 The Tennessee Volunteers enjoy one of the best home field advantages in the country thanks to Neyland’s enormous capacity and rowdy fans. Yet, with so many down seasons between 2007-2014, the Vols seemed to see Neyland empty out quite a bit compared to the days of them competing for National Titles each year. But they do seem to be inching closer to national relevance once again under head coach Butch Jones. Tennessee finished in the top 25 for the second consecutive time, at the end of the 2016 season. That trend needs to continue for Neyland to be one of the best atmospheres. However, even the 2016 regular season did not finish on a good note as they were defeated by in-state rival Vanderbilt on the road. Hopefully the Vols can reclaim the state of Tennessee once again in 2017 and continue to show why Neyland is such a special place for college football to be played each season. DKR plays host to another legendary program in college football that has fallen upon hard times. Yet, many expect the Horns to return to relevance again soon under the direction of former Houston Cougars head coach Tom Herman, who was hired soon after the firing of Charlie Strong. The post-Mack Brown era has not been a friendly site in DKR. Having witnessed DKR in the thick of downtown Austin, it’s an incredible sight to see, even from the depths of the highway on I-35. The state of Texas boasts many competitive programs from Texas A&M to Baylor to Texas Tech, but UT seems to almost always reign king in the size of fan base and on the recruiting trail. 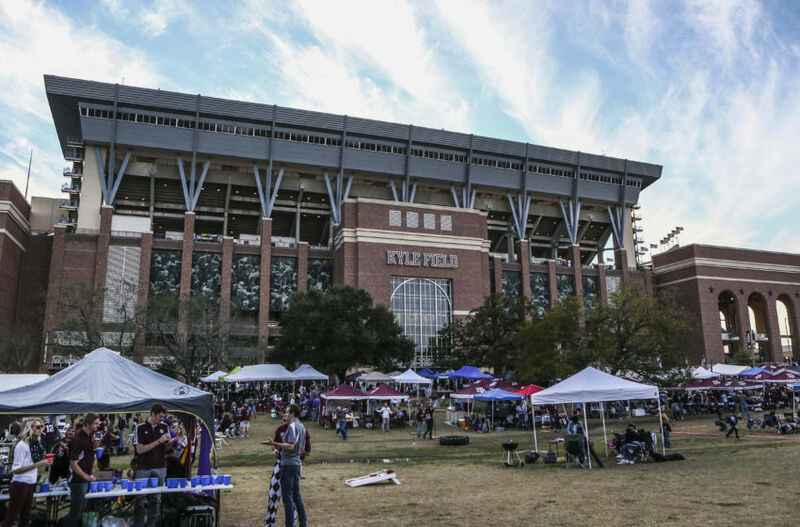 Fans in Austin will always put together a top notch tailgating scene outside DKR that would be fun for many people, even some that are not huge college football fans. 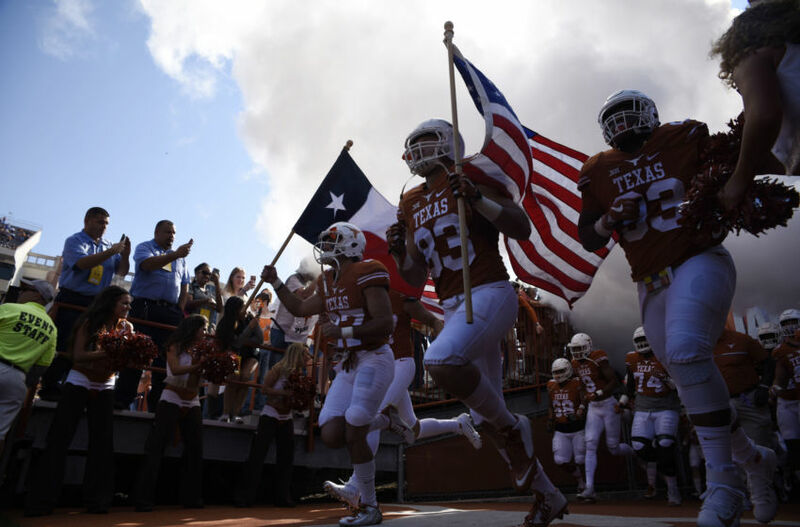 Even just seeing the field from the stands, you can almost imagine running onto the turf at DKR with the American Flag and Longhorn on your helmet. 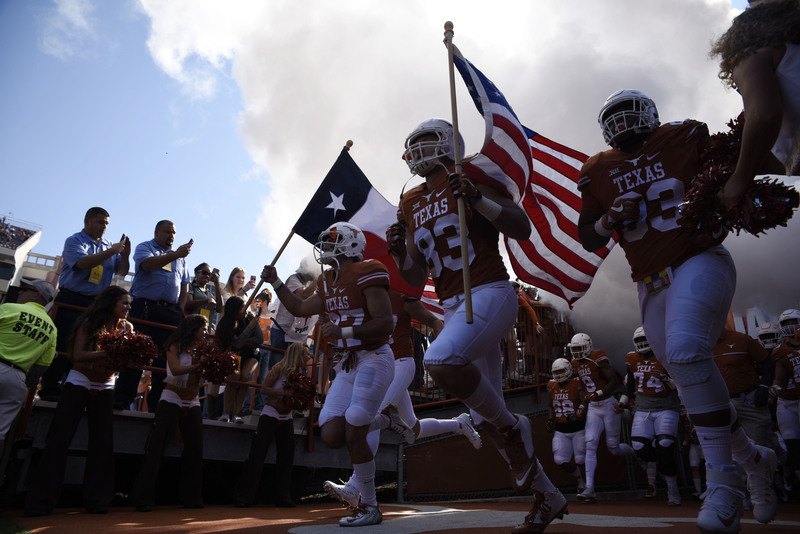 Texas Football means something not just to UT fans, but to the entire state of Texas. The University of Alabama has become the Mecca of the college football world thanks to Nick Saban and the magic he performs every year in Tuscaloosa. The Tide are consistently pulling in no. 1 ranked recruiting classes, winning SEC titles, and even National Championships. Being part of the Alabama Crimson Tide fan base has not been so shabby in recent years. 5/26 – Why does college football matter to millions of Americans? 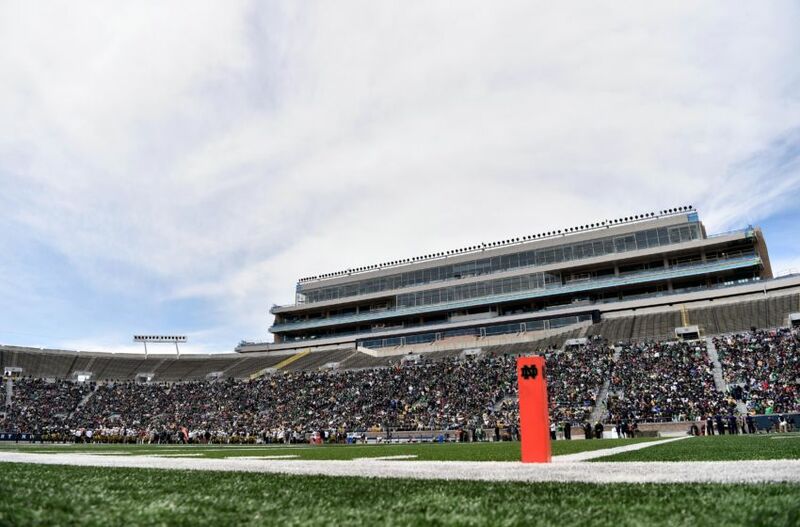 5/26 – Wyoming Football: Is Josh Allen a sure-fire franchise quarterback? It’s hard to miss the greatness on display in and around Bryant-Denny Stadium when you visit. The cursive “A” logo can be spotted all over campus and around the stadium. Statues and memorials to coaches ranging from Bear Bryant to Saban and all the National Titles won at Bama are on display in some shape or form on all sides of the stadium. If you really want something to do that will make your neck hurt try this: walk around the entirety of Bryant-Denny Stadium trying to look at the top of the stadium walls the entire time. It’s quite the hard task to accomplish. 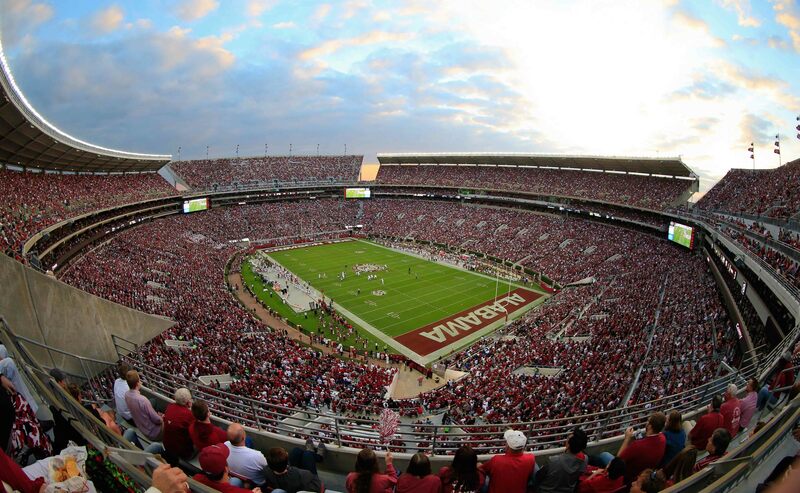 Bryant-Denny symbolizes everything that Alabama football means to the college football world. Monumental success and achievement are represented through almost every aspect of the Alabama football program, and Bryant-Denny Stadium is a clear indicator. The Big 10 Conference seems to run college football when it pertains to stadium sizes. 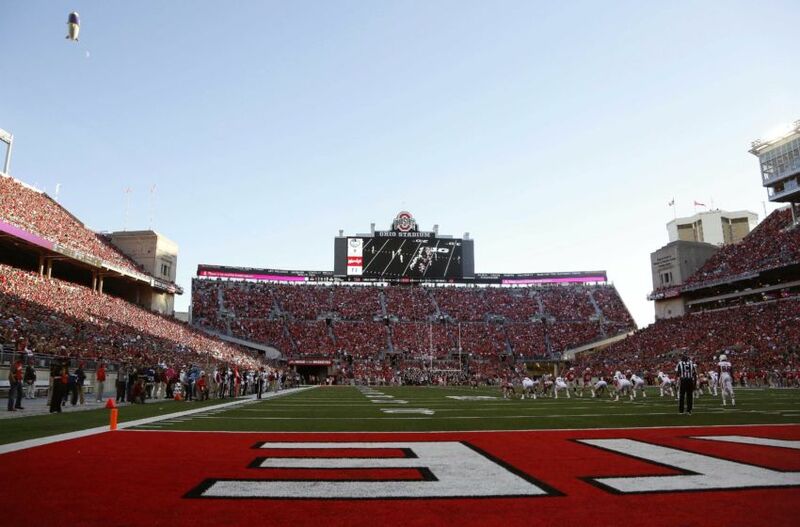 The three largest football stadiums in the country all belong to Big 10 schools (Penn State, Michigan, and Ohio State). Yet, Ohio Stadium has easily seen more recent success than that of any other Big 10 stadium on this list. Hearing the Buckeye fans chant “O-H-I-O” throughout the entirety of “The Shoe” is something every fan watching OSU games on television expects to witness. However, the unique shape, massive size, and overall tradition present at this venue make it one of the three best stadiums that any college football fan could visit. It’s said that football fans born in Ohio are born Buckeyes which makes OSU football special largely to the entire state. Ohio State is the professional team in Columbus and most of the locals adore this program. 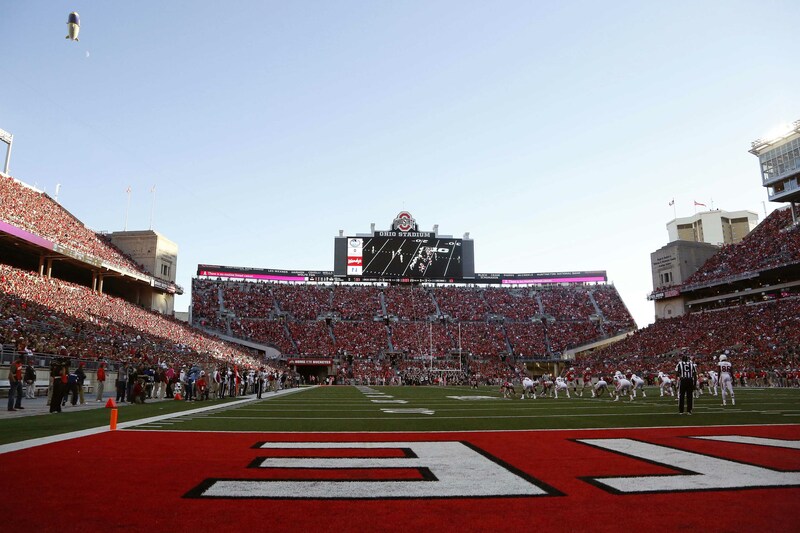 Ohio Stadium is one of the older stadiums on this list, first opened for the 1922 season. It encompasses 10 acres and has fit more than 105,000 fans, standing room only, on multiple occasions. Tiger Stadium is home to one of the most successful football programs over the last decade. Former head coach Les Miles brought a National Title to the program in 2007 after Nick Saban won a National Title in 2003. LSU nearly averaged fan attendance at capacity in 2016 with an average sitting at 101,231. LSU fans also hope that second-year head coach Ed Orgeron brings the Tigers back to heights of competing for a National Championship each and every year while also being ranked inside the top five. Running back and overall athletic freak Leonard Fournette moved onto the NFL but the Tigers still have Heisman hopeful Derrius Guice in the backfield for 2017. 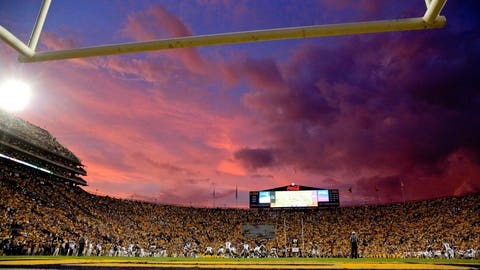 The crazy weather and culture in Baton Rouge make Tiger Stadium that much more of a unique experience to be a part of. 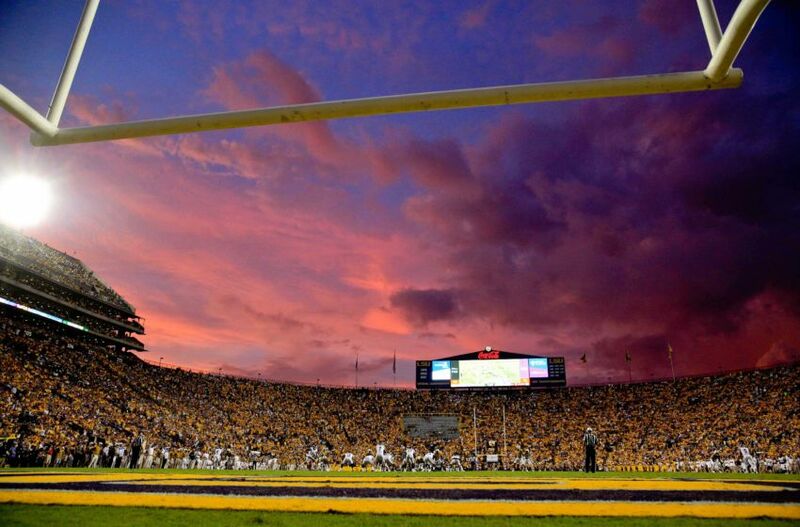 Any college football fan that makes it into the deep southern part of the country should make it a priority to make a side stop at Tiger Stadium. Even the sight of the sky spilling over the letters of “Tiger Stadium” on the outside of the venue is something that you will not forget. Michigan Stadium is the largest stadium in the United States and the number one stadium on this list. When you think of legendary college football stadiums, Michigan Stadium should be one of the first images that pops into your mind. After it’s 2010 renovation, it now holds nearly 110,000 fans. Head coach Jim Harbaugh has injected a huge amount of enthusiasm into this program and just makes Wolverine football that much more fun to watch now. And Michigan Stadium has quite a few sights that are just as iconic as Harbaugh himself. 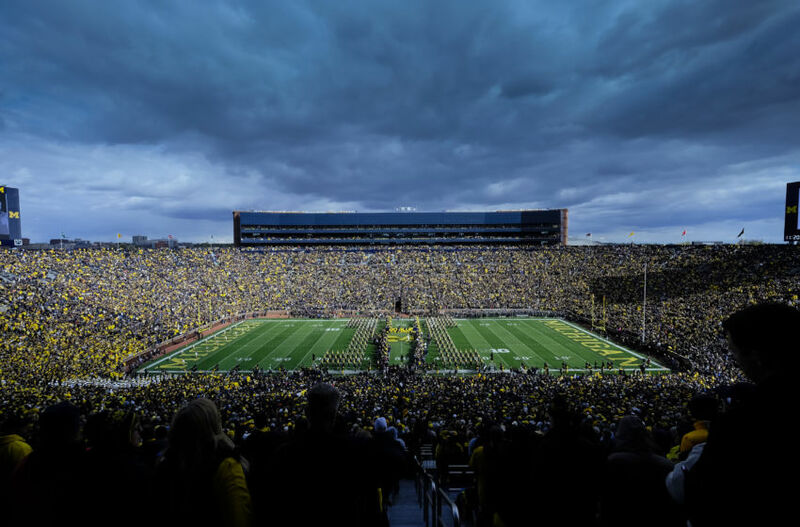 Whether it’s the see of Maize and Blue in the crowd, the giant block ‘M’ on the scoreboard at the back endzone, or two enormous sets of press and luxury boxes overlooking both sidelines, Michigan Stadium is truly a sight to behold. The amount of fans seem endless when looking on from one of the higher sections in the stadium. It would be hard to find many college football fans that would turn down the chance to attend a game at Michigan Stadium over any other venue in the country.